Magnetic fields have both a strength and a direction at each point in space. The strength is a measure of how strong a force a magnet feels when in the field, and the direction is the direction of the force on a magnetic north pole. North poles of magnets on Earth tend to be pulled towards the Earth’s North Magnetic Pole (which is in fact a magnetic south pole, but called “the North Magnetic Pole” because it is in the northern hemisphere), while south poles are pulled towards the South Magnetic Pole (similarly, actually a magnetic north pole, called “the South Magnetic Pole” because it’s in the south). Humans have used this property of magnets for thousands of years to navigate, with magnetic compasses. 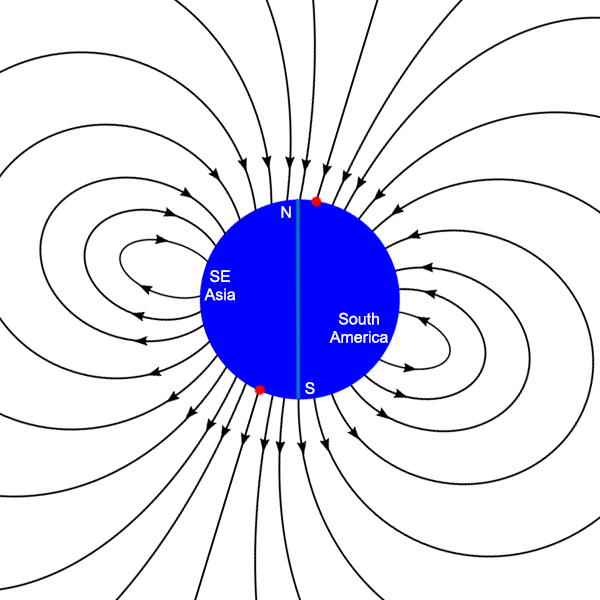 The simplest magnetic field is what’s known as a dipole, because it has two poles: a north pole and a south pole. You can think of this as the magnetic field of a simple bar magnet. 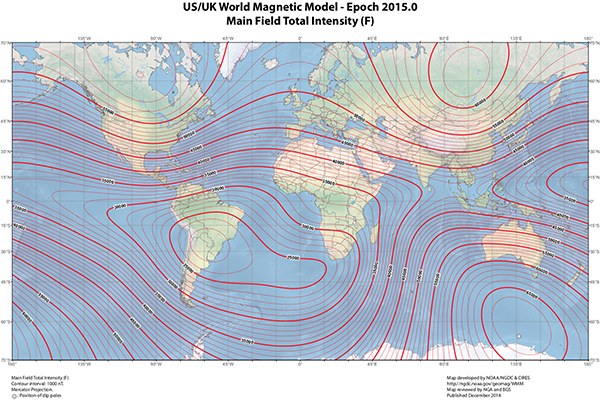 The magnetic field lines are loops, with the field direction pointing out of the north pole and into the south pole, and the loops closing inside of the magnet. 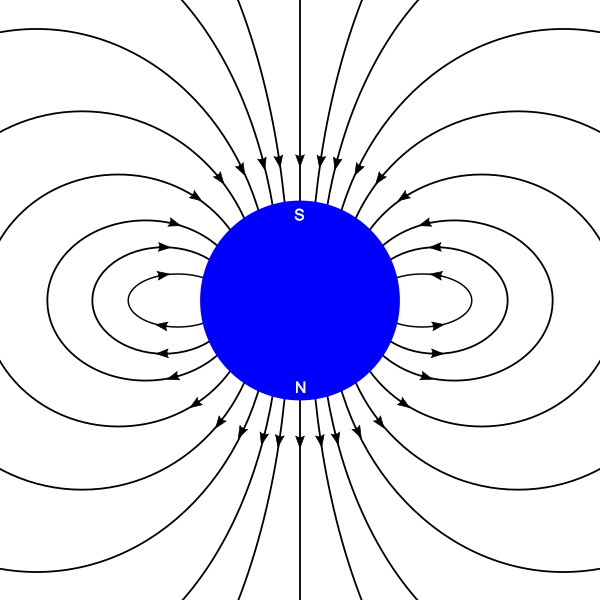 Illustration of magnetic field lines around a magnetic dipole. 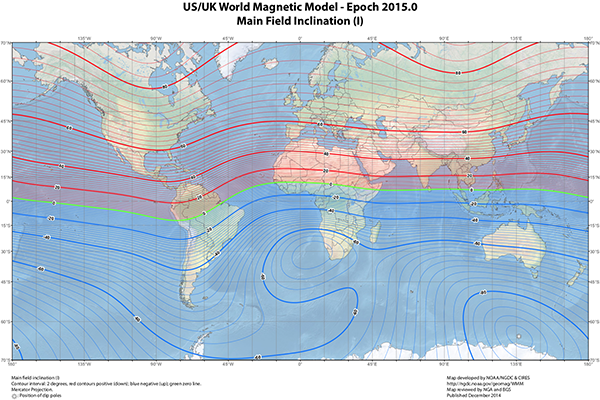 The north and south poles of the magnet are marked. It’s straightforward to measure both the strength and the direction of the Earth’s magnetic field at any point on the surface, using a device known as a magnetometer. So what does it look like? Here are some contour maps showing the Earth’s magnetic field strength and the inclination – the angle the field lines make to the ground. Now, how can we explain these observations with either a spherical Earth or flat Earth model? Let’s start with the spherical model. You may notice a few things about the maps above. The Earth’s magnetic field is not symmetrical at the surface. The lowest intensity point over South America is not mirrored anywhere in the northern hemisphere. And the South Magnetic Pole is at a latitude about 64°S, while the North Magnetic Pole is at latitude 82°N. As it happens, this observed magnetic field is to a first approximation the field of a magnetic dipole – just not a dipole that is centred at the centre of the Earth. The dipole is tilted with respect to Earth’s rotation, and is offset a bit to one side – towards south-east Asia and away from South America. This explains the minimum intensity in South America, and the asymmetry of the magnetic poles. Models of the interior of the Earth suggest that there are circulating electrical currents in the molten core, which is composed mostly of iron. These currents are caused by thermal convection, and twisted into helices by the Coriolis force produced by the Earth’s rotation, both well understood physical processes. Circulating electrical currents are exactly what causes magnetic fields. The simplest version of this so-called dynamo theory model is one in which there is a single giant loop of current, generating a simple magnetic dipole. And in fact this dipole fits the Earth’s magnetic field to an average deviation of 16% . If the Earth is flat, however, there is no such relatively simple way to understand the strength and direction of Earth’s magnetic field using standard electromagnetic theory. Even the gross overall structure—which is readily explained by a magnetic dipole for the spherical Earth—has no such simple explanation. The shape of the field on a flat Earth would require either multiple electrical dynamos or large deposits of magnetic materials under the Earth’s crust, and they would have to be fortuitously arranged in such a way that they closely mimic a dipole if we assumed the Earth to be a sphere. For any random arrangement of magnetic field-inducing structures on a flat Earth to happen to mimic the field of a spherical planet so closely is highly unlikely. Potentially it could happen, but the Earth actually being a sphere is a much more likely explanation. That the simpler model is more likely to be true than the one requiring many ad-hoc assumptions is a case of Occam’s razor. In science, particularly, a simpler theory is more easily testable than one with a large number of ad-hoc assumptions. Occam’s razor will come up a lot, and I should probably write a sidebar article about it. Magnetic North poles of magnets are called that since they point towards the North pole (which is thus a magnetic South pole since opposites attract). When the Earth’s magnetic field flips N/S, will we continue to call the same side of magnets “North,” or will that flip as well? Related: is there a way to tell which end of a bar magnet is the “North” end without reference to the Earth? If you had a setup with several unmarked magnets and some electricity out in space, could you accurately mark which end of the magnets would point North when they come back to Earth? I’m sure we will continue the same. It’s similar to the history of electricity, where we say the current goes one direction, but it later turned out that current is carried by moving electrons, which have a negative charge, and are actually moving the opposite way. Once enshrined in nomenclature, we are stuck with the upside-down-ness of it all. If you know right from left, you can also determine North magnetic poles from South magnetic poles. It’s a bit tricky, though, as are all right/left issues (which chemists call “chirality”, and the rest of us call “handedness”) – at least I always find them tricky: I am a bit “directionally dyslexic”. All you’d need is an iron nail, a battery with labelled + and – connections and a wire. The tricky part is winding the wire clockwise around the nail and not the other way around! As James said, yes, providing you know your electromagnetic theory and have access to tools to build an electromagnet.